Reston Roof Repair and Replacement | Call (703) 345-0601 Now. Roofing Contractor: Repair and New Roof Replacement in Reston, VA. Whether you are a homeowner or a business owner in Reston, Virginia, a roof going bad changes your life fast. A water leak might render your Reston kitchen nonfunctional, and water stains on the ceiling are unsightly, especially when you are trying to impress customers. So, who do you turn to for Reston roof repairs or roof replacement? Ashburn Pro Roofing! Protection for one of your biggest investments in Reston. Quality customer service in Reston. Do you enjoy being awake at night, thoughts running through your mind about whether your new roof will hold up? Probably not. That’s why we offer professional work and as a team combined, we have decades of experience. Our roofing contractor company won’t keep you up at night. Our Virginia roofing repair and replacement company use superior and proven materials so you can sleep well in your Reston, Fairfax County home. A sound roof in Reston, VA goes a long way toward protecting your home. For instance, a water leak can weaken much more than the roof, and cheap materials may cause unseen problems to build and cause real, long-lasting damage. Our roof repair and contractor company has vast experience in working with storm-damaged roofs. Wind, hail, rain and more—we’ve seen it all. Our Virginia roofing company also works with all types of roofing materials. Whether your Reston home or business needs help with a roof replacement or repair project, or with a battered roof, your investment deserves to be protected. That’s why we provide roof repair, maintenance and replacement. Keeping your property and the job site clean. Blocking up or taking away dangerous materials when we are off site. The inspection is easy to set up; just give us a call. We’ll assess your roof for all types of problems, talk with you to understand your needs and discuss the best way(s) to address them. Our projects come full circle, as we finish each with a final inspection. Roofs can be sneaky. Problems do not always manifest themselves, which is one reason why we perform inspections. In fact, our attention to detail is part of why we’ve earned so many customers’ trust. We want your families, co-workers and clients to feel safe. We also keep you in the loop every step of the way. You’ll know what we’re doing, how we’re doing it, when and why. Ashburn Pro Roofing has been serving Reston and nearby communities for some time. We work with commercial and residential properties alike, and we’re a short phone call away at (703) 345-0601. Use the advice below to for maintaining the roof on your Reston home. Inspect your Reston, Virginia home's roof annually. Roofs are commonly most damaged in the spring time. Don't think twice about replacing worn or broken shingles. Replacing or fixing shingles now will prevent trouble and higher energy costs in the future. Your roof will last longer if it is properly maintained. Call a Reston roofer contractor to take care of this project. Make sure to do your homework when you're hiring a roofing contractor. Don't just accept the cheapest contractor you can find in Reston or other nearby towns in Fairfax County. Make sure whatever Virginia roofing contractor you choose has adequate liability insurance. 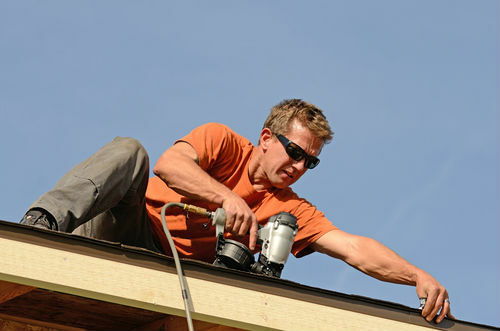 Should something happen to your roof as the roofer is working on it, their insurance company would cover the costs. Don't attempt to fix your own roof. You may think you are saving money, but ultimately you might do more damage costing more in the end. The smartest thing to do is take care of any problem as quickly as possible to prevent things from getting worse. Hire a roofing contractor to repair or replace your roof. Make sure the roofer you hire has experience. Ask your friends and family for any referrals they may have. This is crucial since you want to have a poor roofing work that could be expensive later on. Be sure a roofer that has the proper licensing before they do any work. Contact the local Fairfax County building department in or around Reston and inquire about what kinds of documents you should be looking for from contractors in Northern Virginia. If you plan on hiring a roofing contractor, you should be sure they can provide complete credentials that are totally up-to-date. Nearly every locale needs licensed roofers, so be sure that they have the proper contractor licensing. Keeping your Reston, Virginia roof in tip-top shape is essential. Use the advice above to keep your home's roof and your family protected. A little effort now will keep away any large problems in the future.